1. Match a word in column A with a word or phrase in column B. 2. Complete the following sentences with the phrases in 1. Hoàn thành các câu sau với các cụm từ trong bài 1. The government is making plans to install sensors and cameras in the city centre to _______and drivers to avoid traffic jams. It’s urgent to _______ the city’s transport _______because almost all the roads get flooded after heavy rain. 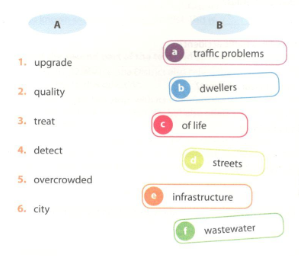 We can improve the _______ of the inhabitants by reducing pollution. _______can enjoy better health care than people living in the countryside, but they are usually busier and more stressed because of the city’s fast pace of life. They are building a new waste processing plant to _______before it is reused or discharged into rivers. 3 Complete the sentences with the correct question tags. There aren’t any shops or restaurants in this street, ________? I think nobody likes to live in a polluted city, ________? Let’s start our discussion on global warming,________ ? Something needs to be done immediately to solve the water shortage problem,________? This is what we need for our new house, ________ ? Stop playing this computer game and do your homework, ________ ? You’ve never got stuck in a traffic jam, ________? Everyone in our class will take part in the school’s Green Campaign,________? 4 Answer the questions, using conditional sentences. What do you usually do if you don’t have to go to school? What happens if you leave a fish out of water? What happens if you heat water to 100 degrees Celsius? What number do I need to dial if I’m involved in a traffic accident? How much is a motorcyclist fined if he doesn’t wear a helmet? Where do you usually go if you have a long holiday? Where can tourists go if they want to taste local food? What time do you usually go to bed if you don’t have too much homework to do in the evening? If I don’t have to go to school, I usually help my mother with the housework. If i leave a fish out of water, it dies. If I heat water to 100 degrees Celsius, it boils. If you’re involved in a traffic accident, you need to dial 115. If he doesn’t wear a helmet, he’s fined up to 200,000 VND. If I have a long holiday, I usually go to (Nha Trang). If tourists want to taste local food, they can go to (the local market). If I don’t have too much homework to do in the evening, I usually go to bed at 10. 5 Some of the sentences are incorrect. Pick out the wrong ones and correct the mistakes. Một số câu không chính xác. Chọn ra những lỗi sai và sửa lỗi. Plants would die if they don’t get enough water. Everything’s been prepared for the project, isn’t it? If you see a fire, call the fire department immediately. Your brother never goes out with his friends if he hasn’t finished his homework, has he? I believe no one can solve the pollution problem, don’t I? There’s been a new plan to treat wastewater in the city, hasn’t there? If you mixed red and green, you’d get yellow. These are devices to detect any heating problems, aren’t these?